The French sculptor Jules Dalou was Rodin's contemporary, and his works occupy key sites in Paris, such as the Place de la Nation. Despite Dalou's success in the public realm, he is relatively unknown. This study exhibition aims in part to rectify that, looking at Dalou's British period, when he was sent into exile for his left-wing connections and, ironically, found his niche among the English aristocracy. During Dalou's nine years in exile, the Countess of Carlisle at Castle Howard was a supportive patron. 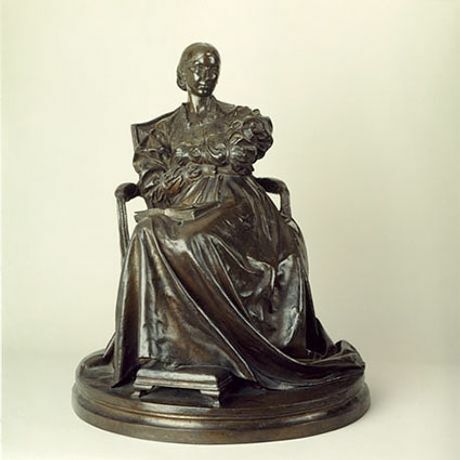 Dalou made an innovative small portrait of the Countess, a bronze version of which is the departure point for this exhibition. The exhibition focuses on four works featuring seated women, drawing on the series of intimate statuettes on the theme of modern womanhood which Dalou made while he was here. Dalou in England reveals how the artist's experience of the Paris Commune, his subsequent exile and move to London encouraged him to concentrate on domestic themes not normally associated with politically progressive art. Arriving with his wife and disabled daughter, the artist remained within a small circle of French-speaking artists and patrons. His experience of exile was one of enclosure within the domestic sphere. The statuettes which Dalou made in the 1870s encompassed women from the working classes, the bourgeoisie and the aristocracy, all rendered in a table-top size that encouraged comparison between the works. These exquisite pieces demonstrate the style of gentle realism that Dalou developed in order to express his ideas about femininity, class and the condition of exile. Dalou's eye for detail  from peasant dress to the latest fashions, as well as accessories such as baskets or chairs  suggests that he is an acute social observer. Dalou in England proposes that these images were meant to be understood as a series; they were created to allow for deliberate comparison. Dalou, through his images of women, revealed and questioned the stratified nature of modern society and its strict demarcations between the classes.